Some Outer Order teachings of O∴A∴ are given freely and openly for personal exploration to allow Aspirants to have some direct experience of the nature of each practice, albeit at beginning levels. Though some general discussion of the nature of Inner Order work must by necessity, in good faith, be openly discussed in order for an Aspirant to understand as fully as possible the nature of the Work, and the commitment being made, all details of Inner Order instruction are to be kept under an Oath of Silence by all so elevated to each grade. Elevations in grade are not considered ‘initiations’ beyond the idea of acceptance to the Novitiate grade of the Outer Order, or the Phoenix grade of the Inner Order. True Initiation is bestowed through Grace by the Higher Genius upon reaching a level of spiritual ripeness, accelerated by the proper initiatory work of the Order curriculum. For the purposes of the Order, anyone participating in open training courses in practical aspects of the Western Mysteries overseen by the Order may be considered an Aspirant to the Order. A Postulant to the Order is someone who has made official application to be accepted as a member of the Order. Any Aspirant who has undertaken enough involvement with the Order and its educational programs is eligible to approach entrance to the Order following the process set forth in the guidelines for Application as Postulant to the Order. A Novitiate has gone through the process of making application to the Order and been accepted as a General Member. All members of the 2° Novitiate grade receive access to advanced Aethyrian Ascension training modules. The Aethyrian Ascension practice focuses primarily on the transcendent (upward or outward current) of consciousness within the overall range of potential experience. As some members may have already learned Sphere One through our open course, Spheres One and Two are available instantly upon elevation to Novitiate. Each available subsequent Sphere will become available in 30-day increments from the day of registration. Though the O∴A∴ is a working initiatory theurgical religious order, the work of this grade is the practice of Aethyrian Ascension itself. Those in alignment with the theological positions, practices, and work of the Order who only wish to practice Aethyrian Ascension as a member of the Outer Order are free to do so with no pressure of taking further elevations. 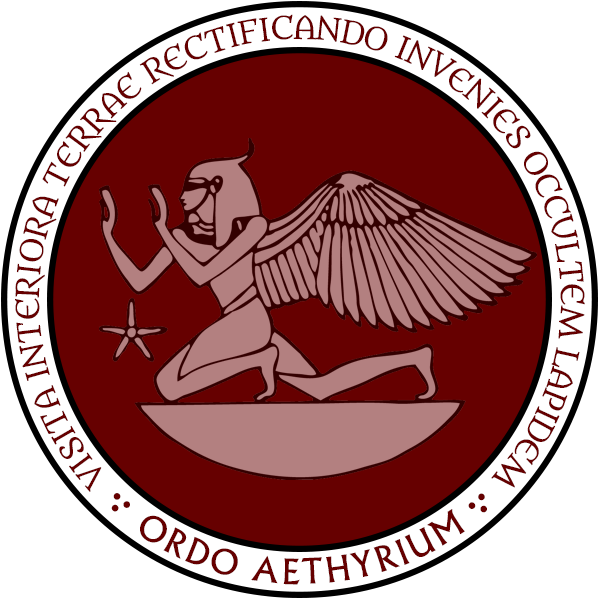 As a General Member, a Novitiate has the right and privilege of participating in other general Outer Order training courses, lectures, discussion groups, and activities in addition to the advanced modules of Aethyrian Ascension training. The 3° Specularis grade focuses primarily on the dedicated practice of Illuminatory Seership to experience the full range of visionary morphing, regular occurrences of quickening of the Dragon, and the benchmark experience of full crystallizations. The Illuminatory Seership practice is the bridge between the Outer Order and the Inner Order. The catalyzing of this functional capacity inherent in all humans is vital for opening spiritual vision and the ability to make progress with practical initiatory theurgical work as taught through O∴A∴ and undertaken as the initial focus of work in the Inner Order. Specularis is Latin for ‘mirrored’ and speaks to the nature of our practice, but also as the idea of speculating about the nature of Deep Magic itself. One begins this practice in speculation about the true nature of real spiritual phenomena and upon success of achieving the benchmark of a full crystallization, one gains the full conviction for oneself that such Deep Magic is indeed not only real but of paramount importance in the pursuit of deeper levels of initiatory theurgical work. Therefore, one does not make application to the Inner Order based upon belief in the ideas of theurgy alone, but with a clear head and upon the absolute certainty gained from direct personal experience (gnosis) of direct spiritual phenomena. The 4° Phoenix grade is an octave of the Lunar work on the Initiate level. It focuses on delving into setting a solid experiential foundation for effective initiatory theurgical training in the subjective levels of interior being. This level of training is the beginning of more immanent levels of integration where skills are gained through practice for safe interaction with specific key intelligences, and application of core practices that shift consciousness to expand knowledge, understanding, and direct experience. In ancient initiatory systems, particularly the Egyptian, initiates were often referred to as ‘Phoenixes’ and as such the Seal of the Order depicts a phoenix in hieroglyphic form as the symbol of our Inner Order and the intensifying of our work in Deep Magic. The 5° Practicus grade is an octave of the Solar work on the Initiate level. It continues with expanding core experience through deeper levels of initiatory theurgical work to attain specific catabolic interactions with key intelligences, while shifting experience into more balance with the objective levels in the continuation of practical alchemy work from the Ens process in the plant kingdom to key processes in the mineral kingdom. This level of training has equal emphasis on core initiatory theurgical practices as well as practical alchemy. The 6° Philosophicus grade is an octave of the Stellar work on the Initiate level. It continues with expanding core experience through deeper initiatory levels of inner work to further integrate catabolic processes of key intelligences that activate the Aethyric body on a conscious level, while pursuing the obtainment of proper amounts of Philosophical Elements in advanced practical alchemy work. This level of training has equal emphasis on core initiatory theurgical practices as well as practical alchemy, and offers the opportunity to begin tutoring those entering the work of the 4° Phoenix grade. The 7° Adeptus Minor grade is an octave of the Lunar work on the Adept level. It continues with expanding core experience through deeper initiatory levels of theurgical work to master walking the Lunar levels of the Aethyrs, while doing the work of purifying the Philosophical Elements in advanced practical alchemy work. This level of training has equal emphasis on core initiatory theurgical practices as well as practical alchemy, and offers the opportunity to begin tutoring those entering the work of the 5° Practicus grade. The 8° Adeptus Major grade is an octave of the Solar work on the Adept level. It continues with expanding core experience through deeper initiatory levels of theurgical work to master walking the Solar levels of the Aethyrs, while doing the work of obtaining Philosophical Mercury in advanced practical alchemy work. This level of training has equal emphasis on core initiatory theurgical practices as well as practical alchemy, and offers the opportunity to begin tutoring those entering the work of the 6° Philosophicus grade. The 9° Illuminatus grade begins as an octave of the Stellar work on the Adept level and ends at the level of Master. This level of attainment is the highest in the realm of human initiation. The work of this grade is to complete the final levels of the Great Work; on the theurgical level it is the full attainment of Stellar consciousness and the Glorified Body, on the alchemical level it is the attainment of the Philosopher’s Stone and the Elixir of Life. Work at this level has no other requirement than to do the work itself. The 10° Templaris grade focuses entirely on Aethyrian Sacerdotal Training. This is the ordination level into the Aethyrian priesthood for the purpose of overseeing temples as an extension of the Overseer of the Order. This officiant level of training requires the grade of at least 7° Adeptus Minor and is not required for all members, only those who are called to this level of service and commitment within the Order. Templaris is Latin for ‘of the temple’ and speaks to the nature of the function itself, as a reflection of attainment in both Inner and Outer Temples. The duties of this grade involve overseeing a temple and performing the Sacerdotal Rites, such as Aethyrian Mass and the administering of sacraments. This officiant class is open to any qualified member who has done the work to attain 7° Adeptus Minor grade, and has no restrictions on gender or marital status. The 11° Aethyrius grade is the Overseer of Ordo Aethyrium. Though Aethyrius is the nomen mysticum of the founder of the Order, ‘Aethyrius’ is also a title. In the chain of succession to the position of Overseer, he or she who holds this position will also hold the title of Aethyrius or Aethyria, as a male or female respectively, in numbered succession. Aethyrius is Latin for ‘of the worlds’ and speaks to the ability to walk the ‘worlds’ or enter other levels of Reality, and thus to the nature of Deep Magic itself. To be eligible for succession as Overseer, one must have completed the 10° Templaris officiant grade, and thus must also be at least 7° Adeptus Minor.